250 kilometres / 155 miles, 13 Golf Courses, ranked as the Top North American Island by Conde Nast Traveler Magazine for 8 years. Sign me up! 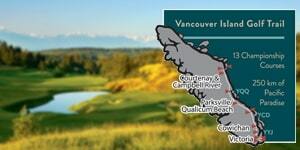 The Vancouver Island Golf Trail takes you from Victoria to Campbell River. 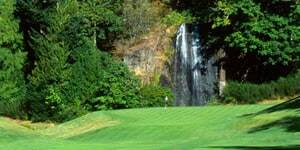 Discover the beauty of Olympic View Golf Club in the South, to the quiet seclusion of Quadra Island Golf Club to the North, Vancouver Island has some of the best golf in North America. 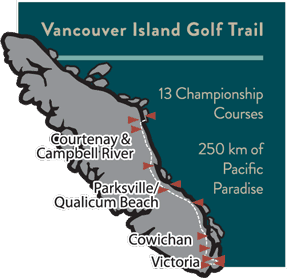 There are 4 regions and 13 Vancouver Island golf courses to choose from making this one of the finest golf vacations in BC. 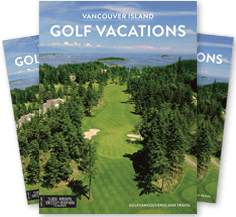 Calgary based journalist Andrew Penner writes “The Vancouver Island Golf Trail is about great golf – sometimes astonishingly good – on one of the world’s most sought after islands. With all that this Pacific paradise has to offer, the Vancouver Island Golf Trail will surely be considered one of the best golf adventures to be found anywhere.” Read Penner’s article Sweet Dreams on the Vancouver Island Golf Trail. 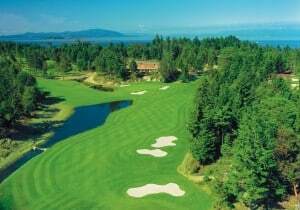 Discover the old-world ambience of cosmopolitan Victoria, fertile and scenic Cowichan Valley wine country, magnificent coastlines and beaches of Parksville & Qualicum Beach and the pristine wilderness of the North Island – you can explore it all on the Vancouver Island Golf Trail, with our Vancouver Island Golf Trail Packages. Some of the most magnificent golf vacation packages imaginable.